Welcome to another First Kiss Friday. It’s my pleasure to welcome back my friend, Jennae Vale and her excerpt from, A Long Forgotten Time – Book Seven of The Thistle & Hive Series. Her covers are just stunning, aren’t they? We hope you enjoy this glimpse into Jennae’s world. Happy reading! Brenna awoke with a start. There was a man in her bed and she was touching him! “Is everything alright? Did you have a bad dream?” Zeke asked, concern evident in his voice. “What’s your hurry?” Zeke teased. “Are you afraid they’ll make us stay?” A crooked grin lit his face, flustering her and causing her belly to do flip flops. Brenna could feel the anger welling up within her. “How would ye know that? Ye’ve only been here a few days. Ye should nae judge,” she yelled. Brenna didn’t speak. He was right, but she wasn’t about to let him know that. She began to get out of the bed, but Zeke grabbed her hand and held her there, rubbing his thumb across it, soothing her, but also stirring something else within her. She gazed at their hands, and felt a warmth that confused her. As Zeke continued to hold her hand, she looked into his eyes and saw sincerity. He really was trying to help her, but why? No one in her life had ever done anything like this for her and it only muddled things all the more in her head. “I’m sorry. I didn’t mean to hurt you.” He looked at her with a funny, sad expression. “Our first fight as a married couple,” he chuckled. “Why? We’ll only be together for a few more days and then ye can be on yer way.” She wanted to be angry with him. It would make their time together easier on her. She couldn’t allow herself to have thoughts and feelings about this man that would only hurt her when they parted ways. He released her hand and she felt regret that he had. Zeke had touched her with his words and his respect for her. It was best to get out of bed and put some space between them. She had to remember this was only temporary. The best thing she could do right now was ignore the man in her bed. The man who made her feel things she did not want to feel. There was no time to think about that now, though. She had to get her things together so they could be on their way. Zeke stayed in bed and watched her as she gathered the few belongings she wished to take along with her. She paused momentarily as she picked up the doll her aunt had made her. She thought about leaving it behind, but found that she couldn’t. It meant too much to her. It was the only good memory she’d be taking along and so she quickly stuffed it into her bag. When she was done she turned to look at him. He is verra handsome. And unlike her Da, he didn’t seem to yell about everything. She would do her best to be pleasant around him. “The few belongings I have are ready to go. Watching you buzzing from one end of the room to the other has exhausted me. I think I need to sleep more.” He lay down and put a pillow over his head. Brenna picked up the other pillow and slammed him with it. He didn’t move. She tried again and this time he threw the pillow off his head and grabbing her wrestled her down to the bed. She wriggled and squirmed beneath him as she became aware that something hard and long was poking her in the belly. Both arms were accounted for and it didn’t feel like a leg. She froze in place, gazing up into a chiseled face and soft blue eyes. Those eyes were gazing down into hers with the same intensity she was feeling. Without thinking, Brenna pulled his head down to hers and kissed him right on the lips. She had only an instant to regret it before he kissed her back and kissed her again and again. Kisses so sweet she never wanted them to stop. Jennae Vale is a bestselling author of romance with a touch of magic. As a history buff from an early age, Jennae often found herself day-dreaming in history class – wondering what it would be like to live in the places and time periods she was learning about. 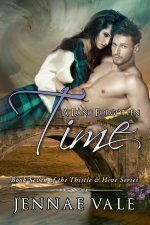 Writing time travel romance has given her an opportunity to take those daydreams and turn them into stories to share with readers everywhere. Originally from the Boston area, Jennae now lives in the San Francisco Bay area, where some of her characters also reside. When Jennae isn’t writing, she enjoys spending time with her family and her pets, and daydreaming, of course. “A Long Forgotten Time” sounds like an interesting story. I’ve never read anything by Jennae Vale. I will have to check out some of her books.